I promised I would bring you all along for the ride when I got engaged to a fellow Disney addict. 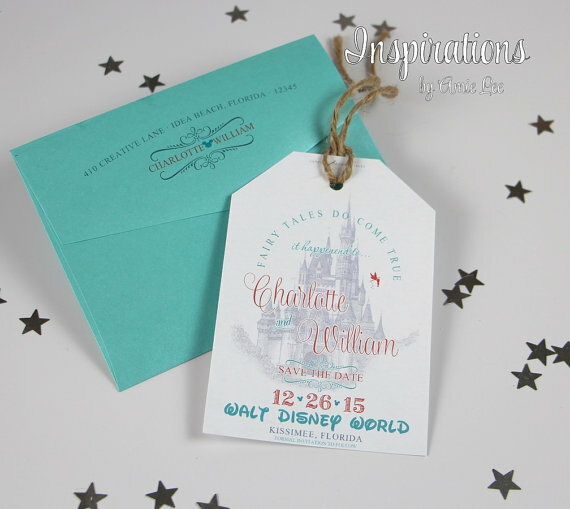 It’s Disney all the way… just as I had planned before the Disney Wedding department even existed!! We have booked the location for the wedding of our dreams (more to come on that later) and now it is time to tell the people in our lives when and where with our Save the Date cards. There are so many choices in which to this and still show your love of Disney! Allow me to show you what I mean! I went on Etsy and there are so many choices with different Disney twists! Do you go vintage? Whimsical? Fun? Where to begin??? One important thing I found was that you really just order a pdf file, when you choose to do it from Etsy. You order the personalized pdf file and then head on over to your favorite printer to produce them. We did this and it worked out well. 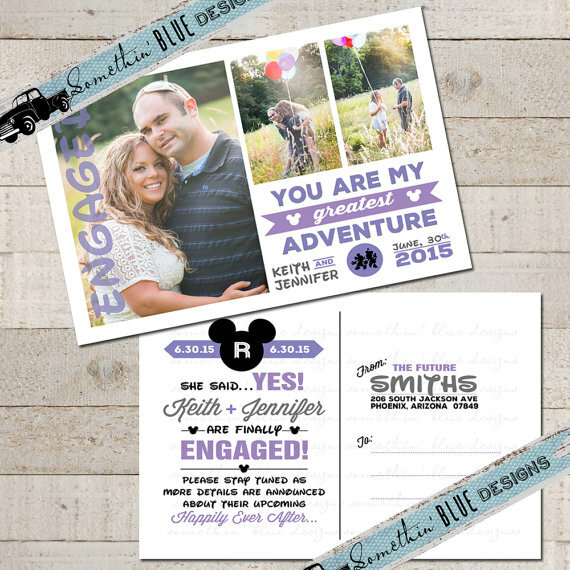 We figured the save the dates could easily just be card stock. These aren’t our invitations, after all, and we can up the ante for our invitations and go to an amazing print shop and pick paper! I thought this one was more than adorable. It is like the Key To The World cards!! These have now been replaced by Magic Bands and, perhaps, would not even be recognized for what they are if the guest isn’t a true Disney fan. Fortunately for me, more than 60% of my guests are Disney fans and they would think these are adorable. They can be found HERE at TheLittleStickyNote on Etsy. 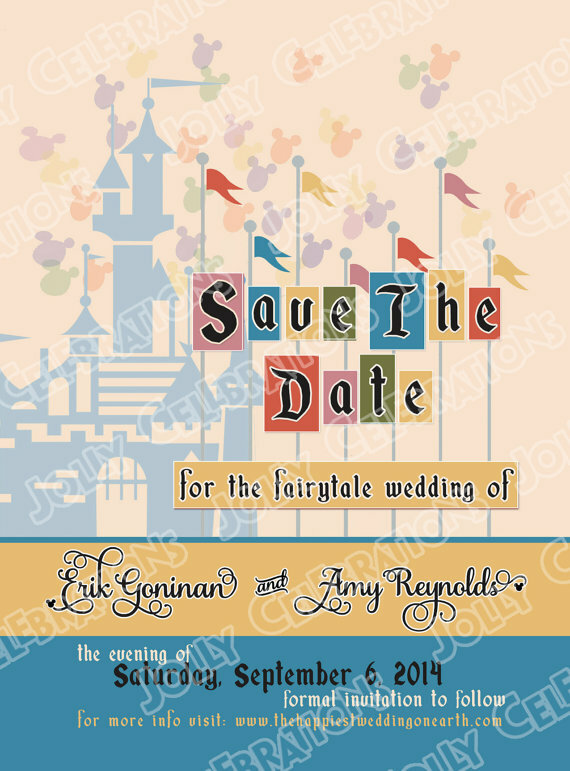 Now this listing is actually for printed Save The Date cards which is good for those of you who don’t have the time to go print them yourselves. They are pricier when you have someone do it for, of course. These are pretty classic, with the picture of the castle as the background. The Disney Font is also used which gives it even more of the Disney feel. There are lots of details available on the store’s page. InspirationsbyAmieLe. You can find this particular listing HERE. Retro is an option and this one is my favorite of those options. It’s colorful and reminiscent of the old Disney we know and love (hence retro :)). It has all the info on it and is perfect for that retro couple. This is back to a pdf option and I think it would be super easy to get done on card stock. I love the faint Mickey balloons in the background! This one was found at JollyCelebrations. 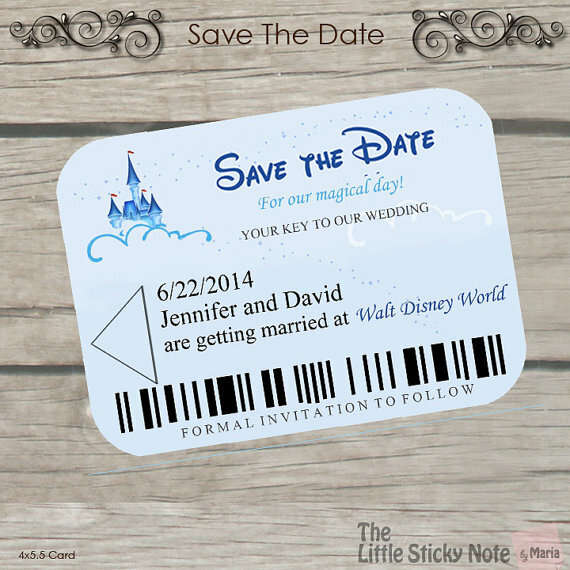 Lots of people like to include a picture of themselves in their Save The Dates and this is a fun Disney option for those people. The Disney font and the throw back to “UP” help start the Disney feel and then the Mickey heads through out the announcement finish the deal. These are more subtly than the other ones I have shown but they are also more personal, as they have the couple’s photo. These are found HERE at SomethinBlueDesigns. Honestly, I could write a 30 page article about this but who’s going to read that. These are just some of the examples I found and the one I ended up with. It’s perfect for the feel of our wedding and the kind of people we are. What do you think of all the choices? Do you have a favorite? Let us know your thoughts in the comment box below!